Broken Spoke: 2 bed / 2 bath. Sleeps 6. Wilderness Luxury awaits! Grab your bags and grab your friends – It is time to make a run to the Broken Spoke. 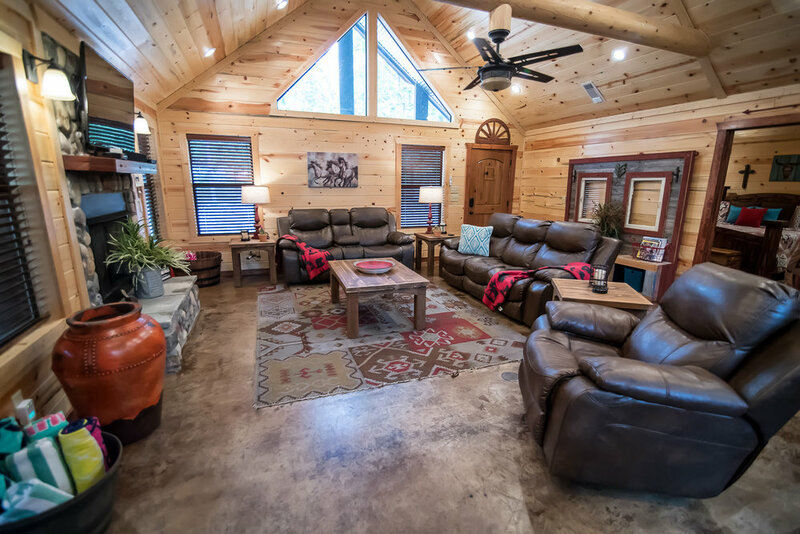 If your hard earned vacation calls for wide open spaces, good times, and comfort –this is the cabin for you. 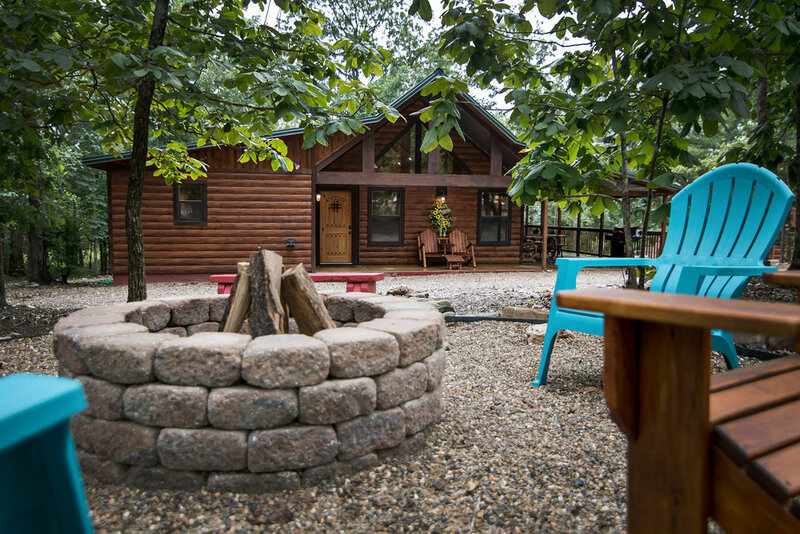 The Broken Spoke cabin has what you need for a great time with great friends. It was designed primarily with couples in mind – but families and kids are welcome as well. The great room is open and spacious – full of country charm, comfortable seats, and places to gather. Whether sitting in front of the stone fireplace or sitting around the dining table, you will find it easy to lose track of time while catching up with friends and family. When you finally realize what time it is you will appreciate the comfortable king beds – each with an adjoining bathroom. Meals are easy at the Broken Spoke – either take advantage of the ready to cook kitchen and gas grill or jump in the car and choose from a handful of great restaurants 5 minutes away. We know you don’t take a vacation to spend all your time shut up in the cabin. The Broken Spoke offers a relaxing private, covered hot tub, a choice of 2 fire pits, outside dining and a horse shoe pit. What if you are traveling with children? Well, the younger kids will love the playground and the older kids will love the free Wi-Fi and cable TV. Everyone will love the short drive to Beaver’s Bend State Park, Broken Bow Lake, and all the fun outdoor activities and shopping offered in the area. 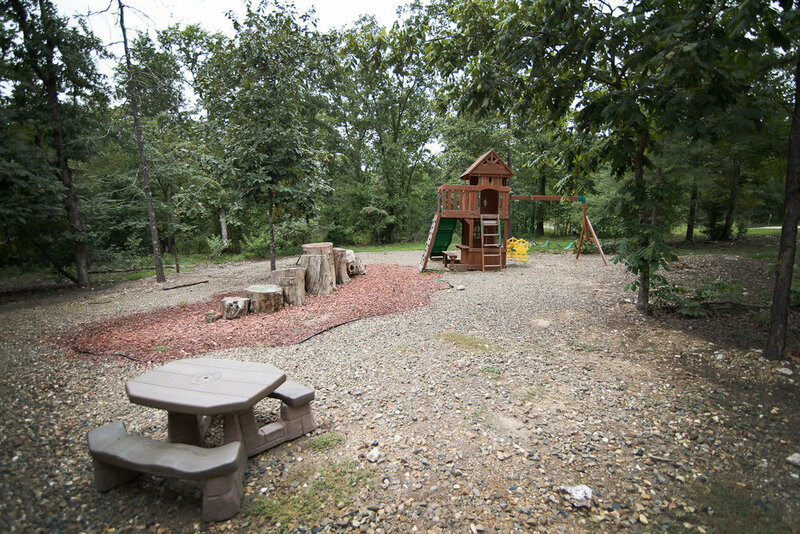 The cabin has a level, easy access parking area, with a circle driveway and plenty of room for boat and ATV trailers.